This web site on Magdalen J. (née Schwert) Hofmann is under development. We welcome your input, stories, photographs, documents, and other resources. Magdalen (= Magdaline) Juliana Schwert was born on July 25, 1886, in Buffalo, New York. Magdalen was baptized on August 1, 1886, by Fr. Ferdinand Kolb, Saint Boniface R.C. Church, 124 Locust Street, Buffalo. Magdalen married George P. Hofmann, who was born on September 16, 1886. Early in their marriage, they resided at 376 Landon Street; at this time, George was employed by the Crosby Company. The 1920 U.S. Census shows the family residing at 401 Winslow Street in Buffalo, with George employed as an "office clerk." By the time of the 1930 U.S. Census, the family had returned to 376 Landon Street. The 1940 U.S. Census shows the family residing at 132 Urban Street. Magdalen died in 1971. George died in 1974. The are interred in Section JJ, United German & French Cemetery (Pine Hill), Cheektowaga, New York. Venita M. (née Hofmann) Baker: Born 1914; died 1975. Ruth Rose (née Hofmann) Bissonette: Born 1920; died 2006. Baptismal Record: Magdaline Juliana Schwert, baptized on August 1, 1886, Saint Boniface R.C. Church, Buffalo, NY. 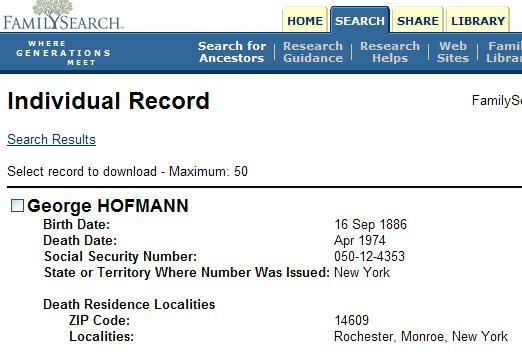 Social Security Death Index: George Hofmann, born September 16, 1886, died April, 1974.